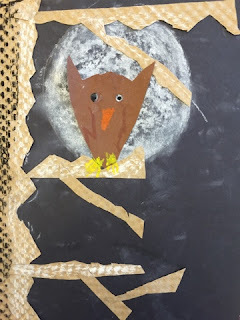 Students and first grade are studying value through recognizing and using light and dark. We began by reading the book Owl Moon by Jane Yolen and pointing out the light source and shadows in the illustrations. 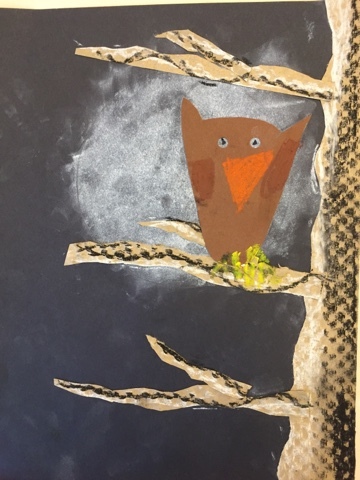 Then, we used a mixture of chalk pastels and collage to create owl and moon images using value. I'd love to try this. Would you give brief step by step directions? Thank you! 2. Have students lightly trace a circle on black paper. Color in with white chalk pastel and smudge with the "magic smudging finger" -- just one! 3. 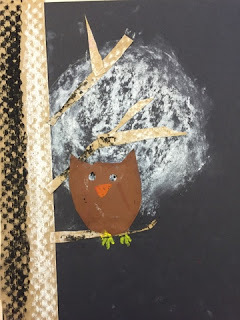 Using textured brown paper, like a packing paper, draw and cut out branches. Glue to black paper. 4. Add value using black and white chalk pastel. 5. 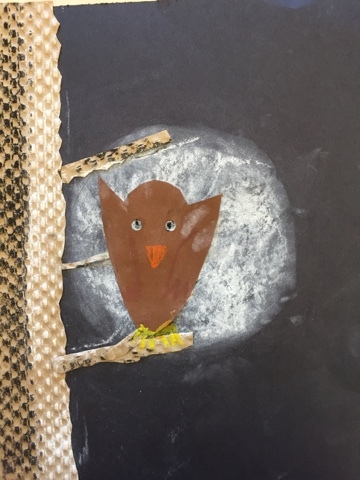 On brown construction paper show students how to draw a simple owl. Cut out eye holes for them using a hole punch. Glue owls onto a branch. 6. Add feathers, beaks, eyes, and feet using oil pastel.